Zebra Trochids are amongst the commonest molluscs of our rocky shores. 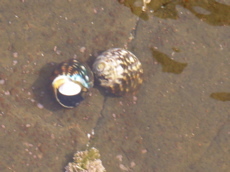 They are spiralled shells with alternate black and white stripes. The width and number of bands are determined by changing environmental factors. These snails feed on microscopic seaweed.